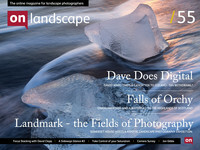 If you’ve looked at the work of large format photographers such as Joe Cornish, David Ward, David Muench, etc. You may have read of a visual effect called ‘looming’ or at least seen pictures where small features appear incredibly large in the foreground. The technique involved is most commonly known through the use of rear tilt on a large format camera and this article hopes to explain what is actually happening when rear tilt is used and also how to achieve it using front tilt or DSLR tilt shift lenses. The first thing to know in order to understand looming is the fact that focussing on closer subjects effectively makes things bigger. The following diagram may help with this. The diagram shows a simple camera sensor in red. You can see I've put the sensor in two positions. In the first, leftmost position the sensor is 24mm away from the lens. Because we have a 24mm lens, the picture is focussed on infinity (focal length is defined this way so a 100mm lens has to be 100mm away from the sensor when focussed at infinity*). * with exceptions - telephoto and retrofocal lenses don't work this way. In order to focus closer, the lens and sensor have to be further away from each other (which is why you need extension tubes for very close focus). In the rightmost red sensor we've moved it twice as far away which just happens to mean we're focussed at lifesize (1:1). If you look at the way the light has diverged from the lens you can see that the image gets bigger as you move the sensor away from the lens. You can visualise this happening because it's the same effect as moving a projector further away from a screen to make the image bigger. So what happens when we tilt the sensor? Well one end of the sensor is further away from the lens and hence the image gets bigger. And that's all there is to looming. When we use rear tilt we move part of the sensor away from the lens and hence we both focus closer and we also enlarge the image. Here's the diagram. Again you can imagine the effect if you tilted the projector screen you'd get the same effect. And many photographers think that is the only way you can get the looming effect. But you can treat it as a general rule that within certain bounds you can get any effect that is applied one one standard (i.e. front or rear) and transpose it to the rear standard. So let's take a look at this in practise with rear tilt. I set up my Ebony large format with typical rear tilt configuration and then tried to repeat the configuration by only using front tilt. Here's the result. If we take the second diagram and straighten it up you can better see what movements we've had to apply to simulate rear tilt for looming. Ignore the extra rise on the rear standard and just look at the overall relationship and you'll see that effectively we've used drop front and front tilt. This explains one of the reasons why looming works, we've effectively played around with extreme perspective and instead of correcting it, we've exaggerated it. So with your DSLR tilt shift lens all you need to put on a reasonable amount of drop front and then compose your picture and apply the right amount of tilt for near far focus. Or you could work out your tilt first and then use drop front. Either way it's the combination of the two movements that simulate looming. If you're wondering what the looming effect actually looks like after all of this, here's shot to show the scene..
and here's what it looked like using an approximately 20mm lens with about 10 degrees of rear tilt. As you can see we've made the small succulent look rather larger than it actually was in real life. You could get a similar affect with a very wide angle lens but the background of the shot would then disappear towards the horizon.